Investments in the stockmarket have turned more than 9,000 Kenyans into dollar millionaires, with latest data showing that super-rich individuals have put at least a quarter of their money in listed companies. A survey by consultancy firm Knight Frank shows that Kenya's super-rich have allocated 25 per cent of their investment portfolios to equities, 22 per cent to property and 22 per cent to cash or cash equivalents. The report states that Nairobi hosts most of the country's ultra-wealthy (net worth of at least $30 million) with 82 residing in the capital as of 2018; the number is projected to rise to 102 over the next five years. The Wealth Report 2019 shows that the bond market has taken up 20 per cent of their investment basket, with only three per cent going to private equity and another three per cent to luxury investments such as art, wine and luxury cars. The super-rich have only put one per cent of their investments in precious commodities such as gold, with four per cent going to other unspecified investments. According to the survey, key sectors that generated wealth last year included financial services (17 per cent), technology and telecommunications (15 per cent), and retail, fashion and luxury goods (11 per cent). Others are transport and logistics, manufacture of fast moving consumer goods, and media totalling seven per cent, and basic materials (the extractive industry such as Although the survey says Kenyans have earned millions of dollars from stockmarket investments, it does not specify which markets the huge earnings came from. 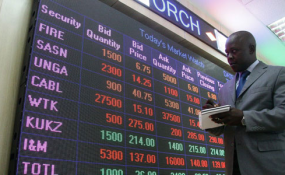 The Nairobi Securities Exchange and the other regional stockmarkets have recently recorded reduced activity, prompting investors to shift funds into alternative investments such as government securities, which have relatively high and stable returns. Last year, Kenyan pension schemes lost money in the stockmarket due to poor performance of the share trading business. Cumulatively, pension schemes reported an average return of 5.7 per cent for the 12 months to December 31, 2018, compared with 17.9 per cent in 2017, according to a survey by Zamara Actuaries Administrators and Consultants. Returns from offshore investments were also not encouraging due to the unresolved US-China trade tensions. In 2018, investments in Kenya's equity markets recorded an average return of negative 13.1 per cent, down from 31 per cent in 2017. The decline in performance of the equity market was compounded by the exit of foreign investors pursuing high returns in developed markets such as the US. Other stockmarkets in the region also recorded mixed performances, largely due to reduced corporate earnings. The EAC stockmarkets have had few initial public offerings as privately owned firms have shied off the market due to stringent regulations and the high listing fees. According to the Knight Frank report, Kenya's political and economic environment made it more difficult for investors to create and protect their wealth in 2018 than in the previous year. It is also feared that the current unpredictable political and economic environment will make it harder for investors to make and safeguard their wealth this year. Sanlam Investments East Africa's latest market report shows that the Ugandan Securities Exchange All Share Index and Local Share Index were down two per cent and 0.1 per cent respectively in February, due to decreasing prices of large-cap stocks on the back of excess supply relative to demand. Headwinds persisted at the Dar es Salaam Stock Exchange despite the two main banks, --NMB and CRDB -- posting relatively good performance in 2018 compared with 2017.